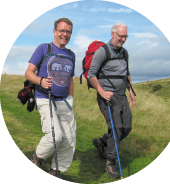 Most people choose to walk St Cuthbert’s Way over 5 days, covering 10-15 miles per day at a comfortable pace, allowing time to enjoy the scenery, villages, sites and features along the way, and to arrive in good time to settle into your accommodation. More experienced walkers may choose to complete the route in four days. Others prefer to take their time and enjoy walking the route more leisurely over six days or more. Alternatively you might want to walk St. Cuthbert’s Way in sections over a longer period, or choose from the St Cuthbert’s Way Official Short Walks Guide. Daily route distances and overnight stops can be tailored to suit your own fitness levels and accommodation availability. 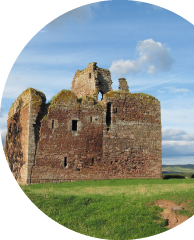 Some walkers may prefer to leave Melrose and just walk 12km (7.5 miles) to stay overnight in St Boswells at the end of their first day. Your final day is likely to be determined by tide times and available accommodation – some people walk right the way through from Wooler and cross the sands to Lindisfarne in one day, others spend the night at Fenwick and walk across to Holy Island the following day. * The final section leads from the mainland across to Holy Island. You can take the causeway onto the island, or follow the posts of the historic Pilgrims Path across the sands. Whichever option you choose to cross you must allow 2 hours to cross during the low tide safe crossing times (and again back to the mainland if you have not booked overnight accommodation on Holy Island).